In the spring of 1870 a small group of Irish immigrants traveled to the Solomon River valley near the town-site of Dell Ray, which later was named Glasco. In 1878, the first Catholic church was built in Glasco on the same lot where the present church stands. In 1909, a limestone church was built. Stone for the church was quarried north of Glasco and hauled to the building site by teams and wagons belonging to members of the parish. The cornerstone-laying ceremony was held May 25, 1910. The present church bell was given to the congregation when the Presbyterian Church was torn down in 1950. A parish hall was built on the lot east of the church in 1954-55. It is also of native stone. In 1878, the people of German Lutheran faith began holding meetings in various homes. Ground was broken for the first Lutheran Church in the spring of 1883. On November 19, 1883, the new church was dedicated. In the beginning years the seating of the members followed the custom used in the homeland of Germany, with the men seated on the right, women and children on the left. The service was spoken in German. Prior to 1918 all records of the church were recorded in German. The present Lutheran Church was started in 1949 and completed in 1950. Contemporary stained glass windows have been installed in the church and are frequently visited for their beauty. 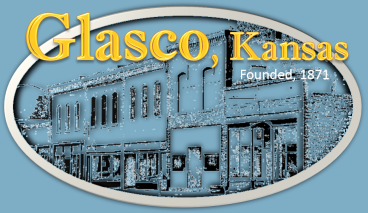 The Christian Church of Glasco was organized and established June 23,1878, In June 1879, a charter was obtained. In 1916, a new building was erected on the lot just east of the old building, the corner of East First and Haynes Streets. The same building is still the church today. During the years between 1938 and 1949, the Presbyterians joined the Christians for services. In 1956, there was a major remodeling project in the basement of the church building. The stairs were relocated and two new folding doors installed. In 1960, a complete remodeling of the sanctuary was completed. On May 1, 1870, the Methodist Church was organized. The first church was built in 1884. The building burned April 11, 1890. A new building was built and dedicated in the fall of 1890. In 1914, the church was remodeled, the basement and annex added, the stained glass windows installed, and the entire structure veneered with brick. The Wurlitzer organ, piano and bell tower were added in 1952 and 1953. On May 1, 1960, the new altar and remodeled sanctuary were dedicated. July 1, 1967 groundbreaking ceremonies for a new education building were held.